Are you headed to Google I/O? Join Realm in Mountain View and San Francisco for some I/O fun! Whether you have tickets to the conference or are just in town for the other events, we have something planned for you. Women in Android Panel: Realm and San Francisco Android Developers are hosting a Panel discussion on the second night of the conference at Realm Headquarters (Details and registration below). 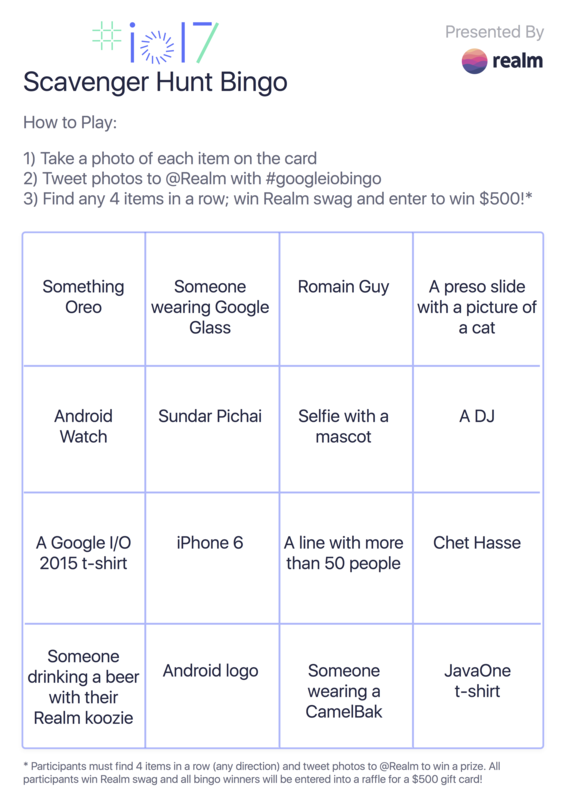 Google I/O Scavenger Hunt and Realm Swag: Can’t make it to San Francisco but still want in on the fun? Don’t worry, look for us at Shoreline on Wednesday before the Keynote. We will be handing out details about our Google I/O Scavenger Hunt and some fun Realm swag. Realm and the SF Android Developers Meetup invite you to our Google I/O Women in Android Panel. Angella Derington is a seasoned Android developer with a passion for creating experiences that delight the user in their simplicity and polish. In the last few years, she has been busy working on the Android apps for major retailers. When not building apps, Angella keeps herself busy with her two kids, dog, and two cats! Nicolette Yadegar is currently the Technical Lead for Support Engineering on Microsoft’s Yammer Android team. As Team Lead, she focuses on Performance and QA, while working on internal projects including upgrading/adding new libraries, adding fun features like GIF support, and refactoring efforts. Before that she worked at Microsoft on their IoT Innovation team and their Frameworks & Services team.